Al Qaeda leader Osama bin Laden called for Iraqi insurgents to unite and avoid "extremism" that causes divisions in a new audiotape aired Monday on Al-Jazeera television, trying to overcome splits by some Sunnis who have opposed the terror group's branch in Iraq. Bin Laden said insurgents should admit "mistakes" and that he even advises himself not to be extreme in his leadership. The tape appeared to be in response to moves by some Sunni Arab tribes in Iraq that have joined U.S. troops in fighting al Qaeda members, as well as other Sunni insurgent groups that - while still attacking Americans - have formed coalitions opposed to al Qaeda. "Some of you have been lax in one duty, which is to unite your ranks," bin Laden said in the audiotape. "Beware of division ... Muslims are waiting for you to gather under a single banner to champion righteousness. Be keen to oblige with this duty." "I advise myself, Muslims in general and brothers in al Qaeda everywhere to avoid extremism among men and groups," he said, saying leaders should not build themselves up as the sole authority, and that instead mujahideen should follow "what God and his prophet have said." Bin Laden used the Arabic word "ta'assub," which in traditional Islamic thought means extremism in allegiance or adherence to a group, to a degree that excludes others - apparently advising flexibility to overcome divisions. The authenticity of the tape could not be immediately confirmed, but the voice resembled that of bin Laden in previous messages. Al-Jazeera did not say how it obtained the tape. Laura Mansfield, who runs a small, private intelligence company from outside Atlanta that is often first to discover and publicize al Qaeda media productions, told CBSNews.com Tuesday that she had found the full bin Laden audio and was in the process of translating it. U.S. counterterrorism authorities were studying the content and authenticity of the audiotape. However, officials often note that no one has faked a bin Laden recording in the past. 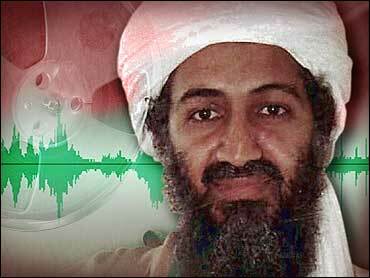 Bin Laden has released a flurry of audio and videotapes recently after not being heard from for more than a year. His last tape, released in late September, called on Pakistanis to rebel against President Gen. Pervez Musharraf. He also released a video to mark the sixth anniversary of the Sept. 11, 2001 attacks on the World Trade Center and Pentagon. IntelCenter, a U.S. counterterrorism group that monitors militant messaging traffic, said more tapes from bin Laden might be coming, noting that he released multiple messages in 2006 after a similar long period without appearances throughout 2005.